Canadian Bush Pilots-Virtual Horizon's Fly-in Pancake Breakfast flight from Africa to the Arctic. The story as it happened. Join along right from the beginning on an adventure filled journey as we fly up from the rainforests of Nigeria, over the Sahara Desert, Western Europe and along the North Atlantic to Canada. The all Canadian Turbo-Beaver as rebuilt by Viking Air in Sydney, B.C. I was tasked with bringing our Turbo-Beaver back to Canada for a complete rebuild. After much negotiations we gave the job to Viking Air in Sydney BC. Klaus was supposed to be on leave but as he didn't want to miss out on the excitement he decided to come along as my co-pilot. Since there are very few floatplane facilities enroute, we regret that we have to take the floats off and put on the wheels for the trip. We draw straws as to who does the first "wheel" take-off and landing. I get the honour. The bush strip which I made myself with a D8 dozer is only 600 feet, but no problem for the Beaver. 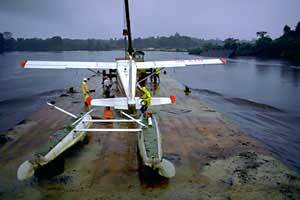 From the changeover strip we make the short flight to Lagos where we outfit the ferry tanks. Installing the ferry tanks are a chore, because all the fitting are missing. That, of course, is a ferry pilot trick where all the fitting are custom made and removed by the pilot after delivery of the aircraft. Although they can't take the tanks back they leave them disabled so that not just anyone can be hired to ferry the aircraft next time without making a new set of ferry tanks. That is unless you have a machine shop. With calipers, a tap and die set, and the machine shop tools we quickly replace the original custom fittings using salvaged parts and one small fuel drum bung slightly modified. The British engineer of the company doing our Beaver's maintenance is not impressed and will not "sign off" the ferry tanks. I argued that since the ferry tank fittings do not fall under the certificate of maintenance we do not need to be signed off by an engineer. A pilot can sign it off. On our test flight I discover, however, that the machined plug we used has only 1/2 the flow of the original, and the engine is burning fuel faster than the fuel pumps can deliver from the ferry tanks. I calculate that we can still depart without delay as with a worse case scenario our total burn will equal about 10 hours instead of the planned 13 hours. If we power back for several hours during the flight the fuel pumps can manage to catch up with the burn and we can make up the difference. I take the responsibility to go ahead with the flight, and we depart on the scheduled hour. After getting our military over-flight permits for the next two countries, we head North. There will be nine countries and seven fuel stops altogether. 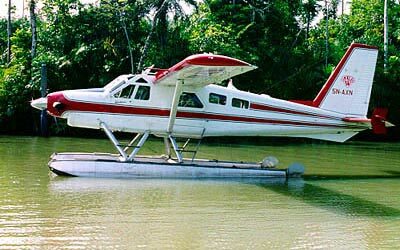 and floating it over to the bush strip in the jungle. Order the Best Beaver Book Ever! Note from the Editor. To browse the rest of the web site let the attitude indicator take you back to the Virtual Horizons home page. Last modified on April 21, 2013 .